On Monday, the same day that it announced a strategic partnership with Germany’s Deutsche Telekom, Evernote rolled out a big update for its Android (s GOOG) version, including enhanced photo features, shortcuts and document search for premium users. Shortcuts: Shortcuts, which let users “quickly jump to notes, notebooks and tags that you access frequently,” were already available on Evernote for Mac and are now on mobile for the first time. 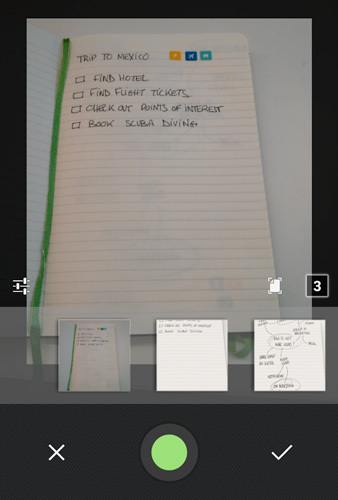 The Android app now works with the Evernote Smart Notebook by Moleskine, which was introduced for iOS (s AAPL) in August. Hi from Neat! We wanted to comment because just like Evernote, we strongly believe in providing a simple solution to manage the constant flow of information and task lists that surround you without drowning in paper. Here at Neat, we aim to solve information overload by providing solutions to manage your paper and digital clutter problem. NeatCloud and NeatMobile can be used to immediately capture, organize, access and share your information. By using the camera on your mobile device, Neat users can take a picture of a receipt, business card, or meeting note so there is never a worry of it getting lost or overlooked. Users can also organize their digital information by sending anything to their personalized @neatcloud.com email address. Simply create an expense report right from NeatCloud and share it with your accountant or find any piece of information stored in NeatCloud within seconds by using the keyword search. All of your information is at your fingertips with Neatâ€™s cloud and mobile solutions. To learn more, visit http://www.neat.com.